Can I just say how happy the weather has been making me lately? out of that mode though, because there is still a month of school. Speaking of school though, only one month until I graduate college! but today I cut them into shorts, I definitely love them a million times more now! Anyways...as one giveaway ends, another giveaway now begins! all of their beautiful goodies! 1.) Become a fan of Les Jumelles on Facebook. 3.) Leave your e-mail address so I can contact you. have the cute little vintage whistle. courtesy of Les Jumelles; platforms courtesy of Blowfish. P.s You look fabulous like always! Love your outfit. The trouser short remake is amazing. I'd love to get something from Les Jumelles! I follow them via facebook and you via both GFC and Bloglovin! Congrats on your upcoming graduation! Just postpone thoughts of lazing in the sun for one more month and then you can bask for the rest of the summer. Congrats on graduation! You're so gorgeous! This outfit is wonderful. Yee thanks for the giveaway! I abso love that whistle and I love the vibe of their shop! Oh love your shorts, you look amazing as always! P.S. Thanks for the giveaway. All done)). Our oitfit is amazing! I love your hair down! All your outfits are wonderful. 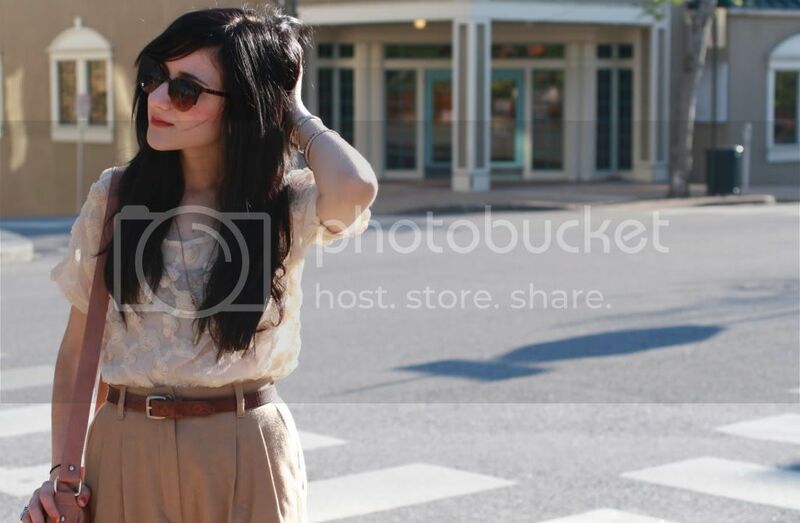 The shorts are great and I really love the blouse. Lovely! I just bought pants like that but dark blue ones :---) im gonna cut them short too !! I love your shorts! I never thought of cutting trousers into shorts, but I do it with jeans so why not? They look awesome. I follow you with Google Friend Connect, and I became a fan of Les Jumelles with my Facebook account. Fan of them and I follow you via Bloglovin! The weather definitely has a profound effect on my mood too, haha. Case in point, today it's cold and rainy and I am not happy. Gimme some SUN and warmth! 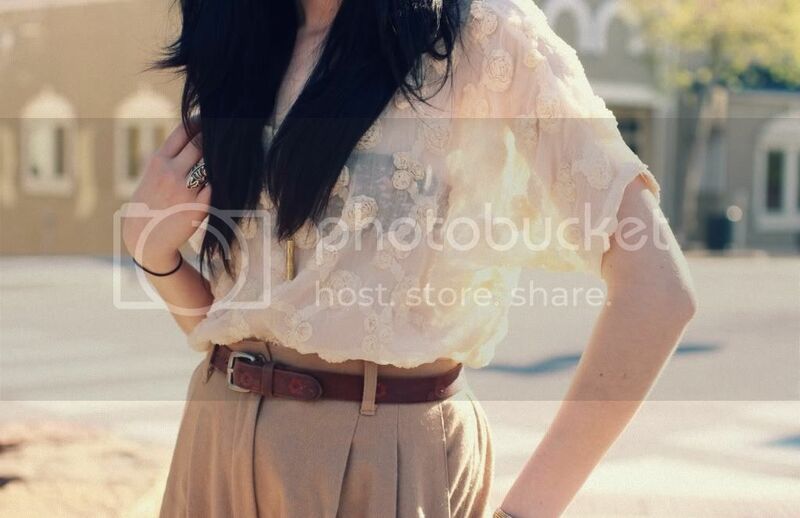 That for sure is a lovely color palette, you look amazing in those high waisted! Love how you cropped the pants. Totally inspired now to try that. I love the tones and how it all blends. definitely entering! You always look so damn gorgeous, no kidding. I love this outfit very much. & The giveaway is so cool ! I follow you with Blogger, & I follow Les Jumelles on FB ( my name is Audrey Marianne ). love those shorts! that is such a good idea! OMG! I won? I can't believe it! I never won anything, this is amazing:D:D I guess you will contact me later. Yay! prettiest lady! love your hair down. and this outfit is so great. you are seriously the best dressed on the internet. my fav! ...and maybe this time I'll be the lucky one! Liked Les Jumelles on facebook and followed you on bloglovin' / google connect. love your shorts <3 you look wonderful! cute! i love your blouse! Your outfit is perfect, I love the top. I'm graduating college at the end of month as well! It's such a weird but wonderful feeling. ohh you look beyond gorgeous! Cute necklace but I'm in love with the texture of your shirt and that satchel! and I also adore your giveaway, it's wonderful idea! great giveaway, les jumelles has some beautiful pieces. LOVE this! Those pants turned shorts are amazingg!! Wow... Les Jumelles has some stunning pieces! I follow them on Facebook and I follow you on GFC and Bloglovin'. liked & following :) you look adorable as always. i'm following you on bloglovin, and liked les jumilles on facebook! ps. I would like to invite you to the first giveaway on blog! Already like them on FB and follow you via bloglovin'! wow i really love this outfit. i love those heels and the fitting of the blouse and trouser shorts. i love it when an outfit makes heels and shorts look classy and you have done just that. i wish it would warm up where iam . the Jumelles jewelry is wonderful - great giveaway! Cute cute outfit, [i always looove your hair, I want it.] I'm excited about this giveaway! Those pants look so freaking cute as shorts!! ah how fun! love the top! Love your outfit. Very cute and romantic. The color palette is excellent. In love with your hot pants! i love ur outfit .it's all about neutrals but still it's very interesting and fresh . Follower of you & liked Les Jumelles on Facebook. great contest! following on bloglovin and liked les jumelles! done liking les jumelles on facebook. lovely wovely outfit uv got there! envious of the bag! crossing my fingers that i win. That top is so delicate and pretty too, it really balances the pants. they are so awesome! I wish I could wear one of them for my prom night. Your look is inspiring! Love it. 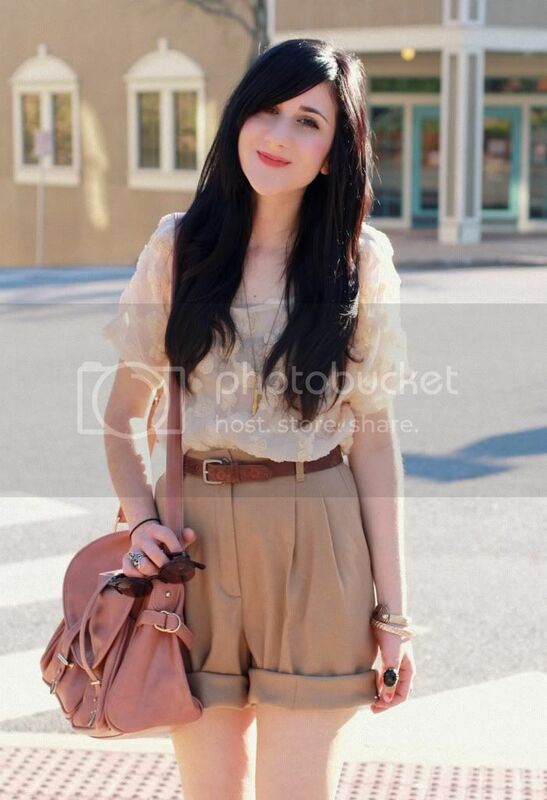 I am a follower and i lovee all of your outfits especially this one! Those pants that you cut into shorts were a great find! thank you again for your generosity! some of us need outside help to participate in the fashion world! This outfit is so perfect. I adore your cutoffs. Such a great idea and they look just like some you could buy in a store right now. I love all of your outfits! Aww little Bonnie, you are so precious! I love what you did with the shorts and that pink bag is so you! oh i love their cute collection, so unique and fun. ive already followed of course and liked the page too. Ahh thank you! I'm a follower! Oh my god, i LOVE it! Cute outfit, the pants-turned-shorts look great! And I love the give-away, les jumelles has such pretty jewelry. great giveaway I love les jumelles!! i'm always scared to wear like beige colors because i'm scared it won't fit my black hair, but obviously i shouldn't be! this looks great! This look is one of my favourites I've seen so far. Love the lace and colours. Love your shorts! Seriously coveting them right now =). Wow, absolutely gorgeus! You are such an inspiration <3 And what an awesome contest! I love Les Jumelles and I agree with your favourite picks! Ahhh I've wanted to get something from there for ages! ey bonniebaby, love this post! it looks like you're in a magical sunshine land. as usual, i feel weird entering your giveaways, so... i'm not going to. fab! and wonderful give away! Im a GFC follower and FB fan of les jumelles! I'm a fan, I already follow you on GFC and Bloglovin' I love your top! And those shorts are cute. You always look so darling. I adore your style sooo very much! homg, i wanna steal this look! PS: I've got a extremely similar bag from Mango. I adore it. i love your style, i love your hair, i love your smile, i love your face. Lovely! OMG, YOURE SO PRETTY, AND I LOVE WHAT YOU WEAR ! These necklaces are so cute! Bonnie, you look so adorable! Cutting those trousers was a good idea, they're wonderful. cute outfit, by the way. i love the diy shorts!